All Concert Design Performance Chairs incorporate the latest technology: maximum stability is attained because body weight is transferred to the centre of the chair via the shock and then distributed into the five-star base, eliminates tipping, provides maximum stability. Concert Design Performance Chairs are multi-adjustable and adjust to YOU rather than your body conforming to the structure of chairs, benches or stools meant for other purposes. Once adjusted, our Performance Chairs fit like a glove. Gas Shock- the quickest and quietest way, ever, to adjust height. Note: the ability to position the seat with a forward slope is scientifically correct for relieving tension and fatigue. * all components are industrial; the seat mechanism in conjunction with the gas shock and the design of the back uprights, provides the multi-adjustability of height, gradient and back support. 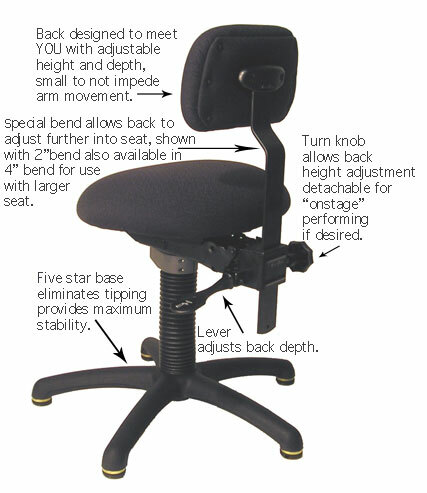 All Performance Chairs are designed specifically non-swivel. * it is very important that all musicians use Performance Chairs which do not swivel. contributes to serious injury and future medical problems. Five-star Base – chosen for stability; chosen to eliminate tipping. * non-slip and non-marring glides. 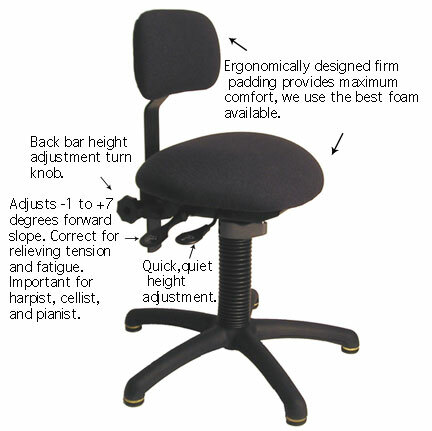 Back-Rest – supports exactly where you wish, adjusts vertically and horizontally. at the lumbar, promoting good posture, aligning the spine so you can concentrate on your performance. Consistently using a back-rest strengthens the ability to practice and perform for longer periods of time. the weight of the harp on the shoulder. A back-rest helps support the body giving more freedom to perform. Bassists can relax during rest periods and enjoy the support of the back-rest. Seat – designed to improve posture and look wonderful. Concert Design works with musicians to develop the different seat shapes for each performance chair. All seat shapes are interchangeable amongst all models. View the individual web pages for descriptions of the various seat shapes. We custom design; please feel free to talk with us about your requests. Information re manufacture and materials. Concert Design purchases many of the components and materials used in our Performance Chairs and ‘gig’ stools directly from companies in U.S.A. and Canada.